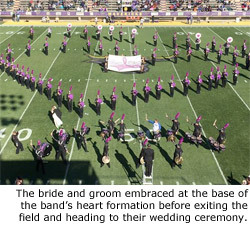 MANKATO, Minn. (Oct. 30, 2015)  When devoted band members Jeremy Friedrichs and Alison Briggs learned their university marching band would have a performance on their wedding day, they knew exactly what to do: ask the director to work a wedding theme into the show. Nearly a year of planning came to life October 24 at Minnesota State University-Mankato when the Maverick Machine marching band performed a show titled "True Love." With recognizable elements woven throughout the performance, the key moment was when Alison entered from backfield in her wedding dress. She marched forward through an archway of flags and approached Jeremy who was strategically positioned near the front sideline  wearing a tuxedo while he played snare. On cue, the couple locked eyes in a moment symbolizing the "first look" when a couple sees each other in wedding attire for the first time. "I was amazed at how beautiful she looked on the field," Jeremy said. "And I was surprised. Even though we had gone through it in rehearsal, and we had done our professional wedding photos before the halftime show, it still shocked me when Alison grabbed me and turned me around." At the end of the show, the couple exited the field and went directly to the Lutheran Church of the Good Shepherd, where the wedding ceremony took place a short time later. Following the ceremony, the Maverick Machine drum line provided a cadence as the newly married couple arrived at the reception. Not missing a performance was very important to the couple. Both Jeremy and Alison have been in the band from the beginning, literally. The Maverick Machine is in its third year of existence, and this is only the second year of performing on the field as a marching band. "Every year I get to watch the Maverick Machine grow," Alison said, reflecting on the source of her dedication. "It gains more students and also more support from the community." Jeremy added, "When we found out a game was scheduled for our wedding day, we began thinking about what we should do, because we couldn't miss the show." The pair's dedication to marching band goes even deeper into their history. Both Friedrichs and Briggs were five-year members of the Mankato Area 77 Lancers, a band that holds numerous championship titles from Minnesota's competitive summer parade circuit. Since the couple attended rival high schools in Mankato, they credit the city-wide Lancers for bringing them together. Jeremy recalls that the relationship kicked off during a Lancers tour in Colorado. "We were whitewater rafting and I jokingly told Alison not to push me off the raft," he said. "In the rough waters she somehow landed on me and just about knocked me out of the raft. From there we sparked a friendship that was meant to last a lifetime." The idea of a special show was appealing to Michael Thursby, director of athletic bands at MSU-Mankato. "We have wonderful programs and big ideas with real world experiences for our students," Thursby said about the university. He began preparing the show almost immediately after learning the performance would fall on the couple's wedding day. Thursby selected the musical repertoire, which included Marry You by Bruno Mars, Sugar by Maroon 5, Hallelujah by Leonard Cohen, plus the Wedding March and Canon in D.
"The band learned the show in only four rehearsals, so the drill wasn't overly complicated, but it helped tell the story," Thursby said. Recognizable forms included two diamonds that morphed into two rings, a giant "YES" that appeared behind a banner reading "Will You Marry Me?," a heart, and an aisle framed by pews which formed a walkway for the bride to enter. A banner was also woven into the show to honor Toni and Tim Diem. Tim is director of the University of Minnesota Marching Band in Minneapolis, and his wife Toni recently passed away from breast cancer. The True Love show was performed just one time for the special day. For the other appearances this season, which include a total of five home games and two exhibitions at area marching contests, the Maverick Machine is performing its pre-game routine and its space-themed halftime show titled "Lift-Off." The special performance has added even more energy to the momentum that the Maverick Machine is experiencing. "Our group has grown from a 30-member pep band in the fall of 2013 to the 118-member marching band this year," Thursby said. "MSU-Mankato had a band in the '80s that was strong, but disappeared for more than 20 years due to budget cuts. Now that we're back, our hope is to grow the program into a 200-member contemporary style group that is different from anything else in the upper Midwest." As for the newlyweds, the honeymoon will wait until an upcoming school break. Mr. and Mrs. Friedrichs still have more band performances not to miss. Images courtesy of the Maverick Machine.